For a company like ours, which is moving from mid-cap to large-cap, the HPO (high-performance) model is critical...When you get to the complexity that we have...(w)e can no longer rely on a few people at the top to make the calls...HPO stops the second-guessing, empowers teams, creates the trust, and enables you to move quickly. Guttman transforms the way people show up and work together: how they lead, make decisions, perform, and manage conflict. People become accountable not only for their own success, but for that of their peers and even their leader. They begin to achieve breakthrough performance. The result is swift and significant: horizontal, high-performance teams and organizations that are less top-down and hierarchical, work cross-functionally, confront and resolve issues openly, make decisions fast, and are fiercely competitive. Building high-performing, horizontal teams and organizations is the most effective way to bring about fundamental change, achieve rapid results, and gain long-term competitive advantage. LeadershipTeam Alignment. Accelerating performance requires every team member to agree on strategy, goals, roles, protocols, and business relationships. We prefer to start with the top tier—the senior team—and then align cross-functional teams at all levels of the business, until the organization becomes a horizontal, high-performance entity. Leadership Coaching. Producing business results is not a solo act. Leading in a results-focused, transparent environment, where peers hold peers accountable, requires a new set of behaviors and fresh approaches. We elevate individual and team performance through a tested coaching process designed to bring about permanent behavior change. Leadership Development. Guttman’s results-based approach to leadership development equips leaders, team members, and individual contributors with the capabilities needed to excel in a demanding high-performance environment. We offer a full range of leadership development experiences designed to meet specific business and professional development objectives, led by a world-class team of Guttman consultants. In working to elevate the performance levels of both current and high-potential leaders, our services span a range of developmental experiences, from raising emotional intelligence to improving the way they lead teams. Our approach is highly interactive, and focused on applying concepts and techniques to on job performance. While the Guttman services can be applied with great advantage as stand-alone entities, their transformative power becomes fully realized when they are carefully integrated. 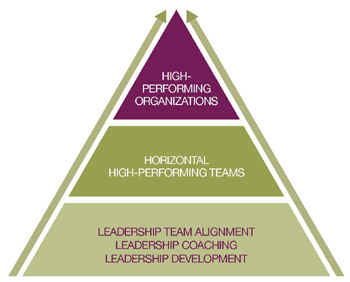 As organizations move from senior-team to multi-tier alignment, then to team and individual leadership coaching support, and on to sharpening leadership capabilities, old hierarchical and siloed patterns of behavior change, a culture of accountability emerges, and mind-sets shift to fully engaged players and “owners.” The transformation to a high-performing, horizontal organization is well underway. Since 1989, we have worked alongside clients to transform team and individual performance, redefine how decisions get made and executed, and reframe how functions and individuals interact. We have put to work a proven process—supported by expert consultants, facilitators, and coaches—for hundreds of clients, including Fortune 100 corporations, mid-sized companies, entrepreneurs, and non-profit organizations. Many of our clients are industry standouts who retain us not because they are underperforming but because they seek to overperform. As industry leaders, they know they must do more to outdistance competitors. Other organizations engage us because they are convinced that they must take up their game. Some have reached a plateau and can’t go higher because they are unable to harness existing talent and capabilities. They possess great individual resources, but misalignment, internal conflict, and silo thinking create dysfunctional teams unable to produce standout results. Our professionals are senior-level organization development consultants with extensive line and staff experience. Besides being highly skilled professionals, they are superior communicators. Why is that important? Corporate leaders value clarity and concision. And we all appreciate those who can communicate with enthusiasm and engage others. Our long-lasting client relationships attest to the excellence of our process for achieving high performance, the skill of our team of professionals, and the ability to be sensitive to the cultural and political nuances within an organization. The Guttman difference goes beyond our proven processes for building high-performing, horizontal organizations, our integrated approach to organization development, our skilled consultants, and our deep reservoir of cross-industry experience. It also extends to our many clients and the unique synergy that occurs when we work in partnership to create teams and organizations built for great performance. Within Australia’s fast-moving, competitive dairy industry, consumers have become more and more sophisticated, with ever-increasing wants and needs. In 2004, the industry was also witnessing dairy production declining, international farm gate milk prices skyrocketing to historic highs, and record global fuel costs. In today's competitive marketplace, in order to become high-performance players, employees need to possess a full range of skills. For many clients, Guttman has custom-designed programs that focus on a number of key individual and team skills. We once coached the executive vice president of a personal care company who happened to be a person of color. After the turnover in her division began to rise, we were asked to work with her to improve her interpersonal skills.